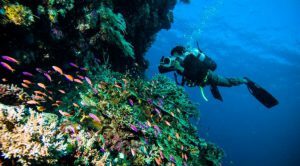 The post Top 4 Marine Life Encounters in Indonesia appeared first on . The post 7 Facts about Sea Lions appeared first on . 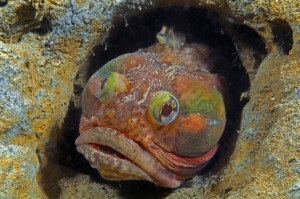 The post The Sarcastic Fringehead: One of the Ocean’s Strangest Fighters appeared first on . When I came across this anemone and its resident fish, it was like an inhabited island in an ocean of sand. There was a lot going on as the Saddleback fish were nesting, and therefore quite protective of their anemone. This particular variety of anemone fish can be quite bold and aggressive, and will charge and nip divers anywhere in the vicinity of their nest. So I braved the pinging attacks, and managed to get this shot of a fish with shrimp crawling on him — assumedly the fish was getting a bit of a grooming session by the shrimp. Divers that slow down while touring the reefs will find that they have more opportunities to witness some interesting behaviors – hunting, courting, mating, egg laying, egg tending, and territorial displays. However, I don’t think that anything is quite as cool, nor entertaining, as the “cleaning stations” that can be found on every tropical reef. This is where fish (including eels and sharks), as well as turtles and other open ocean critters like manta rays come for regular de-lousing by cleaner fish and shrimps. Divers tend to disrupt the process when they arrive on scene, and it takes quite some time of just sitting back a bit, settling in (without touching the reef!) and watching without moving before the animals will again go about their business. It can be difficult to capture images or video of the behavior as fish being cleaned are in a vulnerable position, and are usually very skittish when approached. It is an amazing display of cooperation — the critters that come in to be cleaned hover quietly, then open their mouths and their gills. The little striped cleaner wrasse dart in and around, pecking off small parasites that might otherwise adversely affect the health of the animal, and at the same time, they are getting a snack. The larger animals could easily swallow the little fishes — but they don’t — the little fish are given immunity from being consumed so that they can live on to clean another day. The groupers in Grand Cayman were unusual — many of them did not seem to mind divers in their faces, and carried on with their cleaning routines, even as I took a series of photos. This guy is getting the works — numerous small cleaner fish are busy on him — in mouth, gills, around eyes, and cleaning his skin. I more often see eels being cleaned by shrimp, as eels tend to like to hang out in holes and crevices — which is where the cleaner shrimp tend to congregate. This was a little unusual — I haven’t often seen these little yellow fish in cleaning mode, but this puffer fish was clearly getting cleaned by this little fish when I came across them. Cleaner shrimp tend to inhabit little divots or crevices in the reef, where animals wanting to be cleaned drop by for a session. As you will see in some of the photos in this gallery, these little shrimps are also very obliging about cleaning the nails, and teeth (!!!) of divers, when presented nicely to them. You’ll note that in a couple of my images, the divers have their regulators out of their mouths. These are very experienced divers who are comfortable with this. Please use caution when attempting to entice shrimps into a dental hygiene appointment — you’ll need to feel okay about letting little creepy crawlies roam around in your mouth, and possibly have to spit them out to replace your regulator! This is my oldest daughter getting her nails done on a cleaning station near the Liberty Wreck, in Tulamben, Bali. Our dive guide had told us about this spot before the dive, and planned to take us to check it out. Once the kids saw him getting nails and teeth cleaned, they were all over it. This is the same cleaning station as I mentioned above, near the Liberty Wreck. I love how this little fish is peeking out of my kid’s mouth. She thought this was great fun. I was happy to take the pictures and leave the bugs in mouth thing to them ;^). This is a an image of a crew member from the N’aia liveaboard in Fiji offering up his pearly whites to the shrimps for a little touch up. He knew where this cleaning station was on the site we were diving, and suggested before the dive that we set up this shot. I’ve seen also butterfly fish actively cleaning other animals — mostly the shells of turtles, and, at the mother of all cleaning stations at a famous dives site called Alycone in Costa Rica’s Cocos Islands, swarms of butterfly fish clean the legions of hammerhead sharks that migrate there at certain times of the year, and that come in out of the blue to the top of the (deep) reef to be de-loused. It’s thrilling to witness. This was taken at Alcyone Seamount, off of Cocos Island, in Costa Rica. This infamous site is a huge cleaning station for the swarms of hammerhead sharks that migrate to this part of the world at a certain time of the year. The sharks come in from the blue to be cleaned by the butterfly fish that hover above the reef waiting for them. This is exhilarating, deep diving. Photography is a powerful thing. With the click of a button, time stops. With a single image, a fleeting moment lasts a lifetime. And for five years Underwater Photography Guide has honored the underwater photographers who have mastered this art with the prestigious Ocean Art Underwater Photo Competition. Announced in January, the winners of this year’s contests were selected out of thousands of entries from across the globe by a panel of judges including Tony Wu, Martin Edge, and Marty Snyderman, accompanied by Underwater Photography Guide publisher Scott Gietler. Below is a taste of the incredible images that stood out from the competition, and you can see the full list of winners at tinyurl.com/oceanart2015. We congratulate all of the winning photographers, and encourage all underwater shooters to enter the ring for the 2016 competition! This photo of the endangered wood turtle took first place in the Mirrorless Wide-Angle category of the 2015 Ocean Art Photo Competition. See the full story behind the shot — and full list of winning photos — at Underwater Photography Guide’s website. This photo of a school of starry toado pufferfish took first place in the Novice DSLR category of the 2015 Ocean Art Photo Competition. See the full story behind the shot — and full list of winning photos — at Underwater Photography Guide’s website. This photo of a seahorse retrieving his mate’s eggs won first place in the Mirrorless Behavior category of the 2015 Ocean Art Photo Competition. See the full story behind the shot — and full list of winning photos — at Underwater Photography Guide’s website. This skeleton shrimp photo grabbed first place in the Supermacro category of the 2015 Ocean Art Photo Competition. See the full story behind the shot — and full list of winning photos — at Underwater Photography Guide’s website. This photo of a pod of pilot whales took first place in the Portrait category of the 2015 Ocean Art Photo Competition. See the full story behind the shot — and full list of winning photos — at Underwater Photography Guide’s website. This photo of a model named Francesco “painting” an Axinella sponge won first place in the Pool/Conceptual category of the 2015 Ocean Art Photo Competition. See the full story behind the shot — and full list of winning photos — at Underwater Photography Guide’s website. This Felimare picta photo nabbed first place in the Nudibranchs category of the 2015 Ocean Art Photo Competition. See the full story behind the shot — and full list of winning photos — at Underwater Photography Guide’s website. This barrel jellyfish picture took first place in the Wide-Angle category of the 2015 Ocean Art Photo Competition. See the full story behind the shot — and full list of winning photos — at Underwater Photography Guide’s website. This glowing anemone took first place in the Compact Macro category of the 2015 Ocean Art Photo Competition. See the full story behind the shot — and full list of winning photos — at Underwater Photography Guide’s website. This photo of a houndfish swallowing a brassy chub received first place in the Compact Marine Life Behavior category of the 2015 Ocean Art Photo Competition. See the full story behind the shot — and full list of winning photos — at Underwater Photography Guide’s website. This photo of a frogfish pair about to spawn took first place in the Marine Life Behavior category of the 2015 Ocean Art Photo Competition. See the full story behind the shot — and full list of winning photos — at Underwater Photography Guide’s website. This filefish photo placed first in the Mirrorless Macro category of the 2015 Ocean Art Photo Competition. See the full story behind the shot — and full list of winning photos — at Underwater Photography Guide’s website. This photo of a dolphin from below took first place in the Compact Wide Angle category of the 2015 Ocean Art Photo Competition. See the full story behind the shot — and full list of winning photos — at Underwater Photography Guide’s website. This larval cusk eel photo was taken on a blackwater dive and took Best of Show and first place in the Macro category of the 2015 Ocean Art Photo Competition. See the full story behind the shot — and full list of winning photos — at Underwater Photography Guide’s website. Note: This type of eel might never have been photographed or seen by any diver before! This North Sea anemone photo took first place in the Cold Water category of the 2015 Ocean Art Photo Competition. See the full story behind the shot — and full list of winning photos — at Underwater Photography Guide’s website.